Fields of Blood: Confirmation - At Last! What we don't know are the specifics...suspect the floodgates will open now. And just for Neil - Juillet is July in French. "Age of Sigmar is not the Starter Set of the 9th Edition. It will be a Board Game like Space Hulk or Execution Force and with this Set, the Releases of the 9th Edition will begin." So we may still be in a state of hiatus. I'm sure I went out with a girl called Juillet in my youth. Why Jeff, I do believe your jealous. Would you like me to introduce you to some friends of mine? That was one of the funniest things ever heard. By anyone. Ever. >There is no separate board game or mordheim-sized skirmish game. 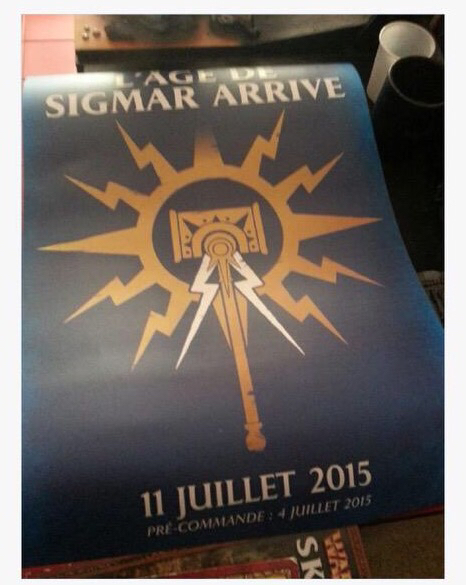 > Age of Sigmar replaces/follows WFB as the other big game next to 40K, though the rules are very different from WFB. > If you even mildly dislike the recent narrative direction of 40K, brace yourself. According the rumour-tracker, he is running 18 confirmed rumours, 0 partials, 0 untrue. So he seems fairly reliable for a rumour monger. The edit above is from someone called Steve the Warboss, who is not considered very credible by the cool-kids at Dakka. There's also an English translation of that image, and a second one with fluff about what the world will have (Lizards it seems). So it might actually be all-happening next month. Enough of the Sitzkreig, bring on the Blitzkreig! I am so glad I am sitting all this angst out while happily painting Judge Dredd and Infinity models. It's something I guess, but really, it could be anything. I am also painted Judge Dredd while the doldrums continue. Sovs in fact, go East Meg 1. WTS - Terraclips "Sewers of Malifaux"
Setting for the "Age of Sigmar"
OMG - It's Worse Than We Thought! What if.....Round Bases are a Troll? The Amazing Disappearing WHFB.....Or Is It?